The discovery and acknowledgement of global warming dates back to the 19th century when Svante Arrhenius, Swedish chemist and physician who was awarded the Nobel Prize in Chemistry in 1903, outlined his theory according to which carbon dioxide has an impact on climate patterns, causing climate change. Since then, the awareness that humanity influences climate and causes anthropogenic effects (climate change) has become increasingly popular. In the first half of the 20th century scientists believed (or hoped) that oceans maintained CO2 levels in the atmosphere unvaried by absorbing most of human-related emissions. In 1957, however, this assumption was called into question by scientists Roger Revelle and Hans Suess who demonstrated that despite oceans absorb extra CO2, they do it more slowly than expected and this would lead to an increase in the average global temperature. Their research was confirmed in the 1960’s and 1970’s when a group of chemists started conducting accurate measurements of greenhouse gases from the Mauna Loa Observatory (MLO), Hawaii. They asserted that carbon dioxide concentration in the atmosphere was gradually rising. 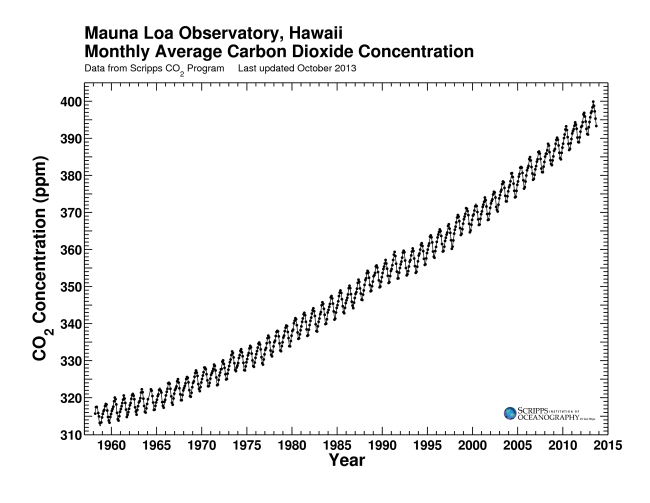 In particular, Charles David Keeling of the Scripps Institution of Oceanography of San Diego, California, made a long-term analysis that became the well-known Keeling Curve, which traces carbon dioxide concentration in the atmosphere month after month, year after year. The fluctuation of concentrations led researchers to define the graphic as the reproduction of the Earth’s breathing. These new figures led the issue to be included in the agenda of some of the most important international scientific meetings in order to start studying the issue – in the 1980’s technologies started to become more advanced and accurate. Scientists discovered that not only carbon dioxide (CO2) causes global warming, but also a number of gases including methane (CH4), nitrous oxide (N2O), ozone (O3) and, indirectly, water vapour (H2O). All of them contribute to creating the so-called “greenhouse effect”. In addition, there are other gases such as CFCs (chlorofluorocarbons) that have been regulated by Montreal Protocol in 1987 as they are responsible for the depletion of the ozone layer. Estimates published in 1985 showed that these other gases together have an impact on global warming just as much as CO2, making the issue more serious and complicated than previously expected. The greenhouse effect, however, is a natural phenomenon that can be described as the capacity of the atmosphere of absorbing and retaining sun rays' humidity and warmth. This is why the presence of these gases is crucial for life on Earth. Without greenhouse gases, and thus Earth’s atmosphere, the average temperature would be -18 degree Celsius, while the greenhouse effect keeps the average temperature around 14-15 degrees. What’s behind global warming is an increase in the global average temperature due to high concentrations of CO2 and other gases that no longer derive from nature alone but are also linked to human activities. The global increase in carbon dioxide is mainly caused by the fossil fuels humanity is relentlessly burning to produce energy (responsible for 75.2 per cent of greenhouse gas emissions), which is used to meet the electricity and heating consumptions (32.6 per cent) and for the transport industry (14.2 per cent). The increase in methane and nitrous oxide is mainly linked to the farming industry (16.1 per cent): this means that agriculture and climate change are intimately related. Deforestation, too, contributes to the increase in carbon dioxide in the atmosphere: forests, especially tropical forests, absorb and retain CO2. This is why their destruction, along with preventing absorbing CO2, releases more carbon dioxide, which was previously “naturally stored”. Since the early 1990’s deforestation led to a 15-25 per cent increase in CO2. By adding the emissions from agriculture and the consequent deforestation it is 21 per cent of the total CO2 emitted into the atmosphere between 2000 and 2010, equal to 44 billion tonnes. 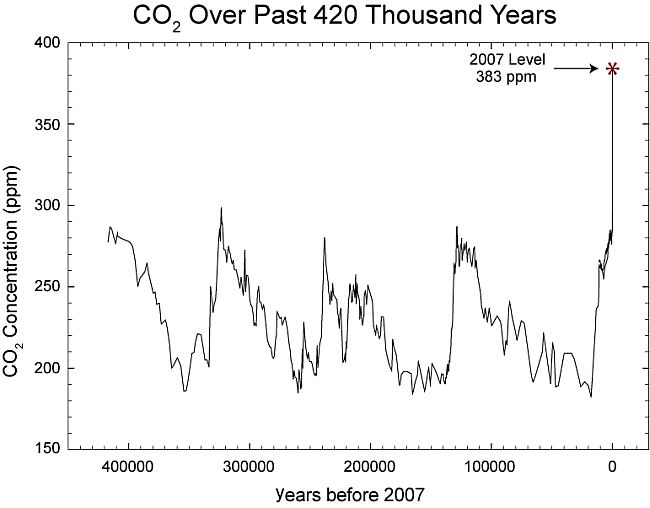 CO2 concentration in the atmosphere passed from 280 ppm (parts per million, i.e. the ratio between the molecules of greenhouse gases and air. For example, living in a world with 350 ppm means there are 350 molecules of greenhouse gases in 1 million molecules of air) prior the industrial revolution to 400 ppm in 2017. It’s a record level as CO2 emissions in the atmosphere reached 41 billion tonnes, yearly. This exponential growth began just a few decades ago. The United Nations Intergovernmental Panel on Climate Change (IPCC), in fact, has chosen 1750 as the reference year to start studying climate change. To fully understand what living in a world with 400 ppm means it only takes to consider that natural CO2 levels in the past 650,000 years were comprised between 180 to 300 ppm. Methane passed from 715 ppb (parts per billion) in 1750 to 1,880 today. Nitrous oxide passed from 270 ppb to 328 ppb. This has already caused an increase in the global average temperature of at least 1 degree compared to pre-industrial levels, according to the World Meteorological Organization (WMO). Even if the concentrations of all greenhouse gases will be kept at 2000 levels, the temperature is expected to increase by 0.1 degrees every decade as oceans struggle to absorb gases. As a consequence, CO2 concentration in the atmosphere would be twice pre-industrial levels by 2050 (about 550 ppm). Actually, current emissions will make us achieve 550 ppm in 2035. In order to curb such a catastrophic evolution of the phenomenon, we should at least achieve the minimum goal of not exceeding 450 ppm by 2050, compared to 400 ppm suggested by many scientists. This goal would allow keeping the average temperature rise within 2 degrees, in accordance with the Paris Agreement on climate achieved in Paris in 2015. It should be noted that the international agreement urges the parties to do everything in their power to try not to exceed 1.5 degrees. In order to succeed, global emissions should peak by the end of the decade and decrease by 5 per cent each year, until reaching a total drop of 80 per cent by 2050 compared to current emission levels. Realistically, countries’ pledges made so far to reduce emissions lead experts to predict a temperature rise of over 3 degrees. Climate change has evident effects on ecosystems and people. Here’s a list of the climate change phenomena we’re already experiencing first-hand. One of the most evident consequences is melting ice – the melting of the cryosphere, those portions of Earth's surface where water is in solid form, including ice caps, glaciers, and permafrost (those areas where soil is permanently frozen). According to predictions, Arctic ice could completely melt during the hottest periods of the year by the end of the century. The cryosphere naturally plays a crucial role in the global climate system and a change in its extension could cause a change in the system itself. Fragile ecosystems like oceans, mountains and wetlands could be damaged permanently. Melting ice caps in Antarctica and Greenland have most likely led sea level to rise by 3.1 millimetres per year between 1993 and 2003, according to IPCC. The rise is expected to reach 15 to 95 centimetres by 2100. Increased levels of CO2 in the atmosphere will also lead to ocean acidification, causing irreparable damage to marine ecosystems – like the Great Barrier Reef that is a UNESCO heritage site as it is home to more than “400 types of coral, 1,500 species of fish and 4,000 types of mollusc. It also holds great scientific interest as the habitat of species such as the dugong and the large green turtle, which are threatened with extinction”. Professional services firm Deloitte estimated the economic value of this treasure: 56 billion Australian dollars, and 64,000 jobs. Desertification (and, thus, heat waves) will expand to areas that currently boast a temperate climate such as the areas north and south of the Sahara desert, including the Mediterranean countries, causing severe damage to agriculture. Crops will significantly drop while more and more people will face undernourishment. In particular, yields from maize and wheat crops could drop by 50 per cent over the next 35 years due to global warming. It’s a risk that has to be prevented considering that people suffering from hunger are currently slightly decreasing. The study State of Food Insecurity in the World 2015 conducted by the International Fund for Agricultural development (IFAD) and the World Food Programme (WFP) estimates that nearly 795 million people don’t eat enough food. They amounted to 1 billion in 1990-1992. Events like El Niño – a variation in the southern oscillation that causes significant changes in climate including hurricanes, storms, flooding in Central America and severe drought linked to wild fires in western Pacific areas – will be more frequent and intense causing casualties and economic loss. This could lead to the outburst of diseases, like malaria, in areas previously unaffected. It’s not only due to climate change, but also because of humanity, that the Earth is facing a relentless mass extinction, the sixth, resulting in a significant drop in our Planet’s biodiversity. Species extinction rate is extremely high and half the living species could become extinct by the end of the century. This biodiversity loss has “grave and far-reaching implications for human well-being,” said John Knox, a human rights expert and professor of international law at Wake Forest University. Knox is also a UN Special Rapporteur on environment and human rights and the author of the first report of the United Nations that recognises that healthy biodiverse ecosystems are essential for human rights. As it happens with desertification, biodiversity loss – in particular of plant species – could slow down disease control and increase the spreading of infectious and autoimmune diseases.